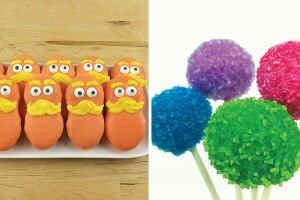 And even more fun to eat. 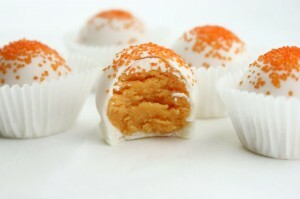 Carrot cake + cream cheese frosting… definitely one of my favorite cake pop flavors. These cats are pretty darn cute. First things first – you will need some basic supplies and pinch of patience. Feel free to make all of the characters or just one. The ghosts, by far, were the most simple. The ingredients below are for ALL of the characters. 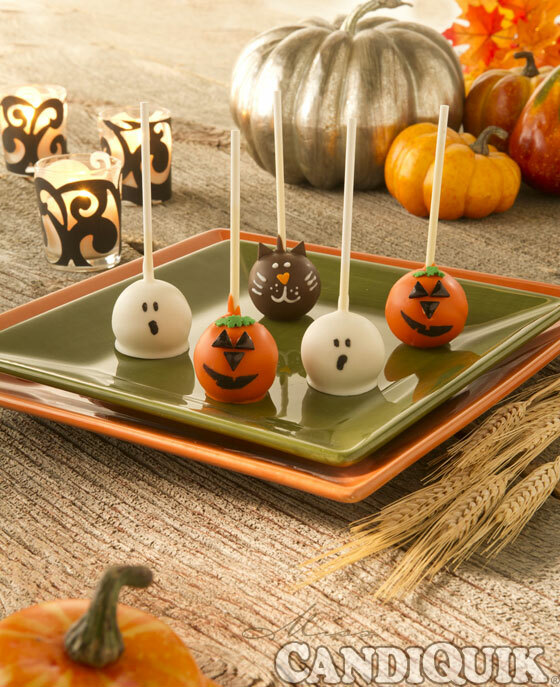 TIP: divide your cake balls into 2 batches & work on ONE character at a time. This will make your life simpler. Crumble cake into a large bowl. Mix thoroughly with frosting. TIP: I always cut off the crispy edges of the cake. Couple benefits here: smoother cake balls, snack for you. 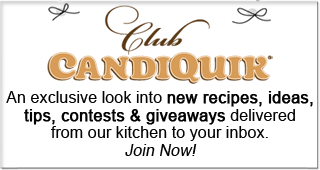 Chill mixture for approximately 2 hours in the refrigerator (you can speed this up by placing in the freezer). Roll mixture into 1” balls; place on a wax paper lined baking sheet. You may need to chill the cake balls slightly longer (20 minutes or so). 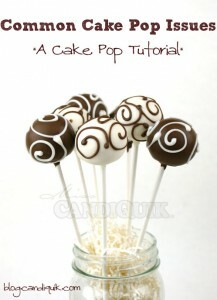 Remove from fridge and insert a lollipop stick into each cake ball. 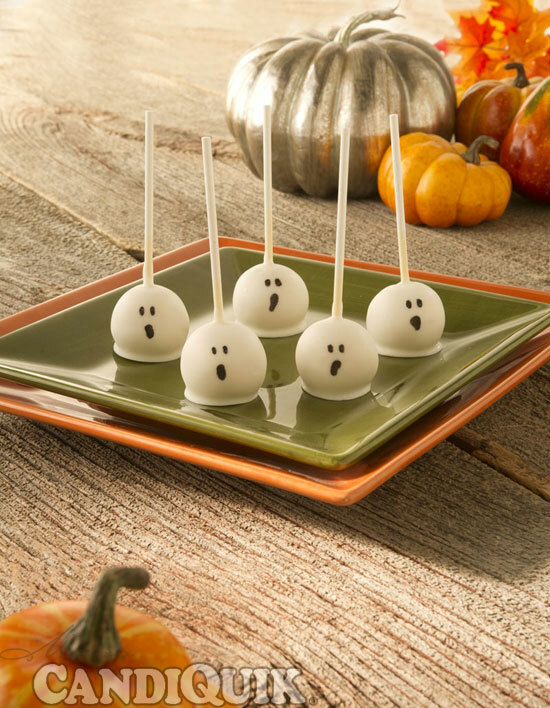 TIP: I always keep a few of the cake pops out and place the remaining pops in the fridge until their time comes. 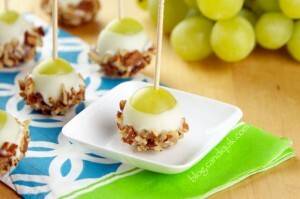 This keeps them cool and will help them from falling off the stick while being dipped. Melt Chocolate CANDIQUIK according to the package directions. 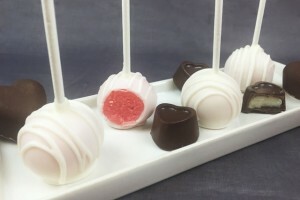 Holding the lollipop stick, dip cake pops in melted chocolate, covering completely. Let the excess coating drip off; place on wax paper. 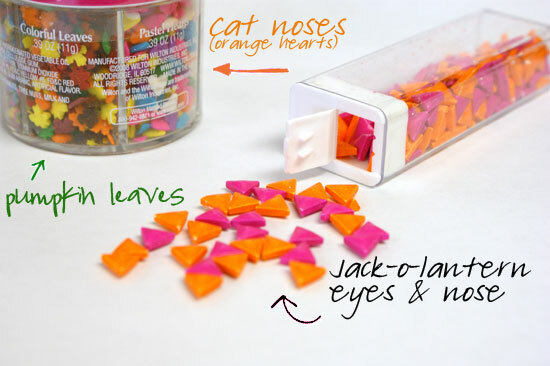 Before the coating sets, quickly and carefully attach a heart-shaped sprinkle as the nose. 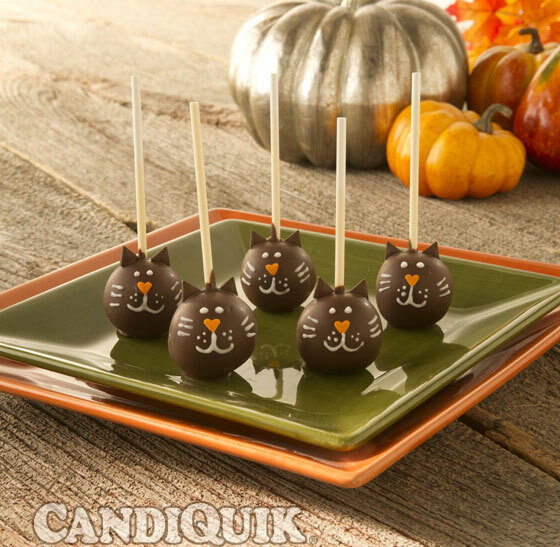 Once dry, use a toothpick dipped in Vanilla CANDIQUIK to draw on eyes and whiskers (you can wait to do this until we melt the vanilla). Use your black edible marker to color the triangles black (for the cats) and to draw on the face for the ghost pops. Melt Vanilla CANDIQUIK according to the package directions. 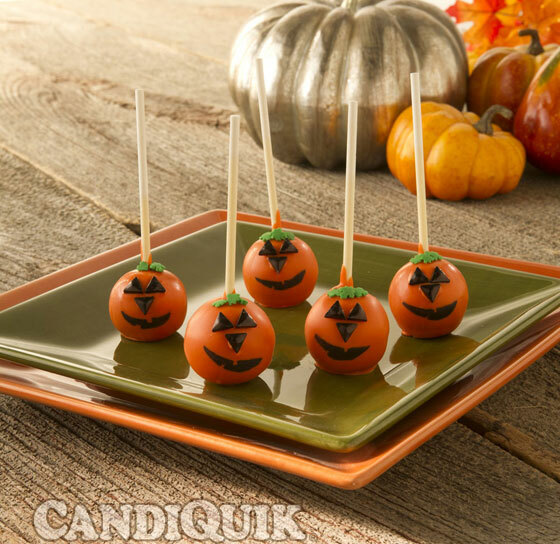 Dip cake pops in CANDIQUIK, covering completely, let excess coating drip off; place on wax paper. Before coating is set, attach 3 triangular shaped sprinkles as the eyes and nose. Then, once dry; use the black edible marker to draw the mouth. Someone’s missing here though, right!? Just kidding! They can be found over HERE. 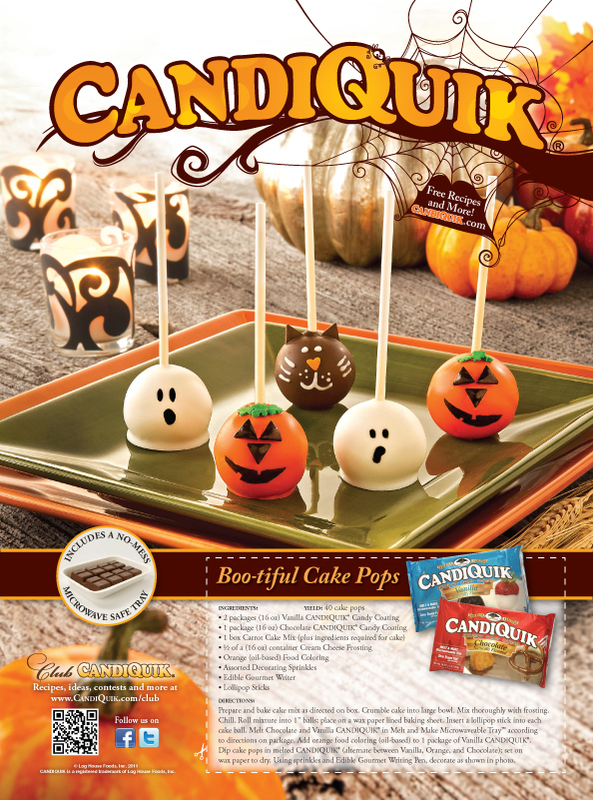 You may have seen these on the back of the Phyllis Hoffman Celebrate (2011 Halloween) mag?! 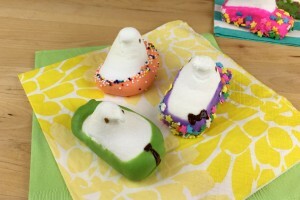 These are wonderful and oh so cute! Thank so much for posting the step by step tutorial. Will have to make these for my little kids A.S.A.P.